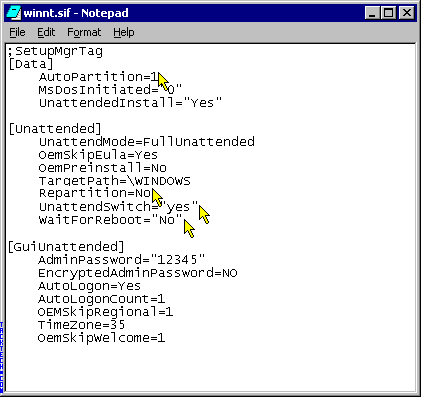 Creating an unattended installation of Windows 2000/XP/.NET (Part 2) (Windows 2000/XP/.NET) - TACKtech Corp. This is Part 2 of Creating an unattended installation of Windows 2000/XP/.NET. Now, for the Networking setup. 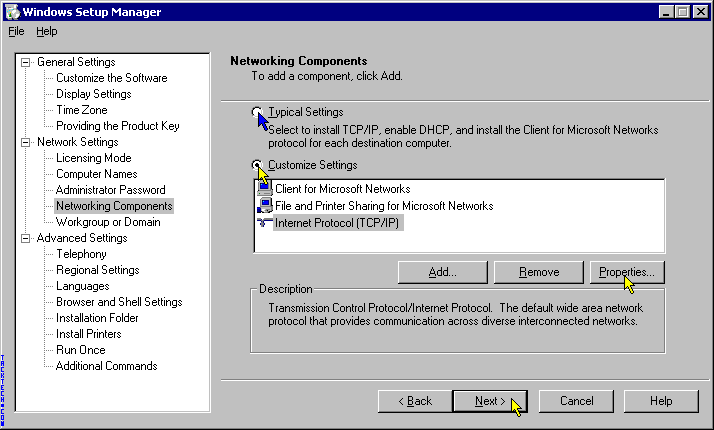 You can choose Typical Settings which is just DHCP setup. Or as we picked you can choose Customize Settings and edit the Internet Protocol (TCP/IP) Properties. You can see the properties options next. 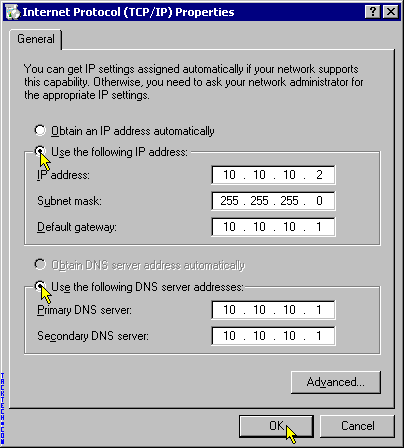 Enter your IP, Subnet Mask and, DNS numbers. Note: Use your own info. Next you finish the Network Setup. 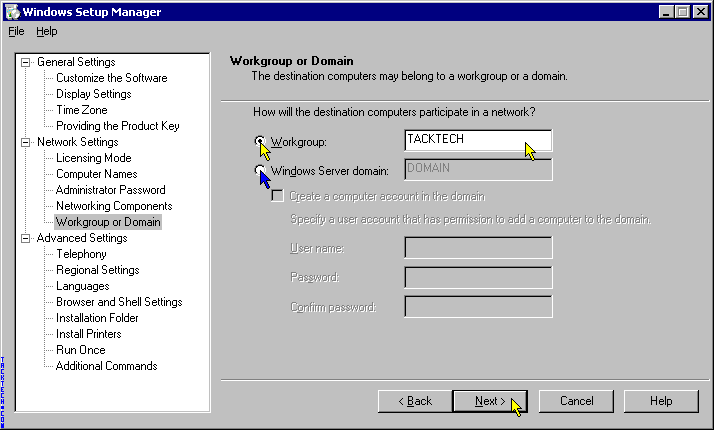 Select Workgroup or Domain Server. Enter your Workgroup or Domain name. 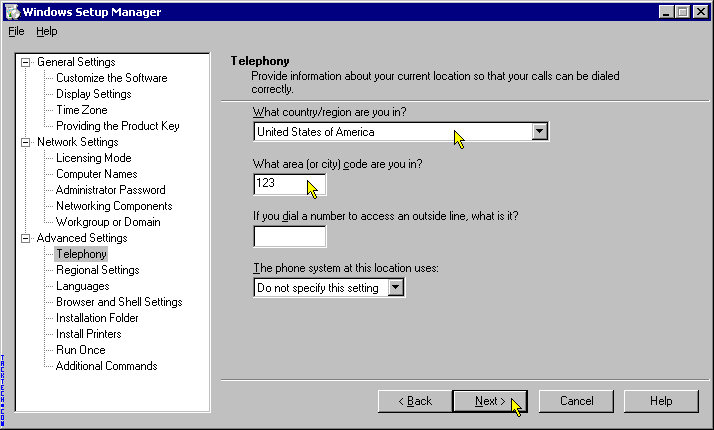 You can pick your Dialup settings here. Click Next when done. 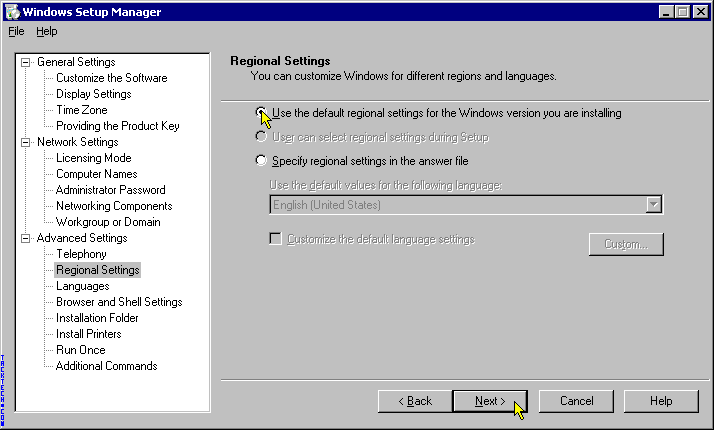 You can edit your Regional Settings here. Click Next when done. 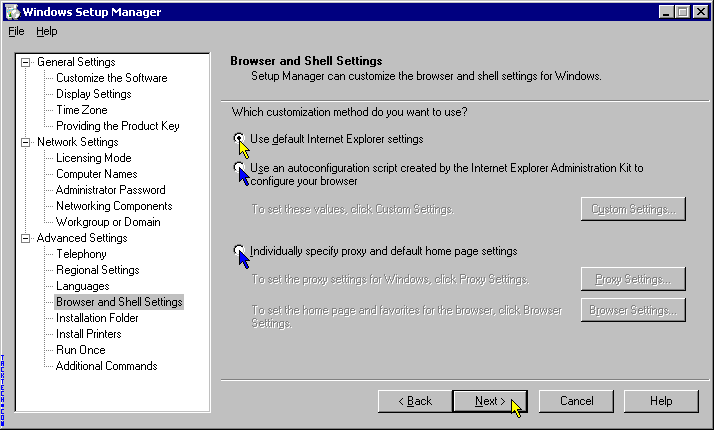 You can customize your Internet Explorer, here. I choose not too but you can read more on it in the help files. Click Next. If you want to auto setup a Network Printer you can here. Click Next. You can setup a run once job here to copy files or do what you need. Click Next when done. Additional Commands can be added here. Click Next. Next you will choose where to save the file and the name. To make things easy call it winnt.sif. This will create a winnt.bat and winnt.sif. 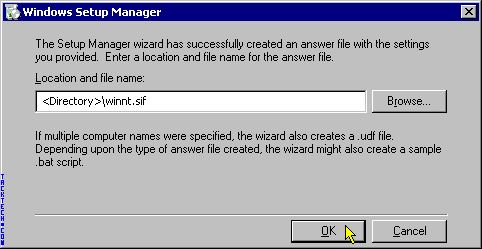 Now, you will be at the final screen and the wizard is complete. You need you edit your winnt.bat file to reflect these changes. This will allow it to work in a CD-ROM drive you put it in. 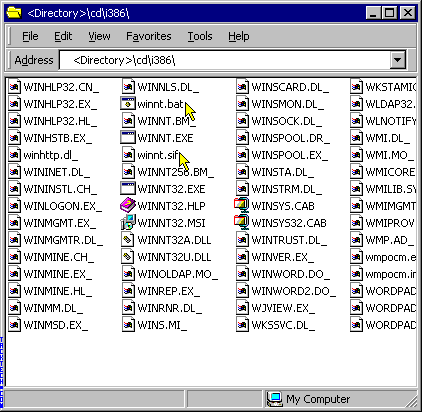 Copy your Windows 2000 or XP CD to <Directory>\cd\. Copy the two files winnt.bat and winnt.sif to the <Directory>\cd\i386\ directory. 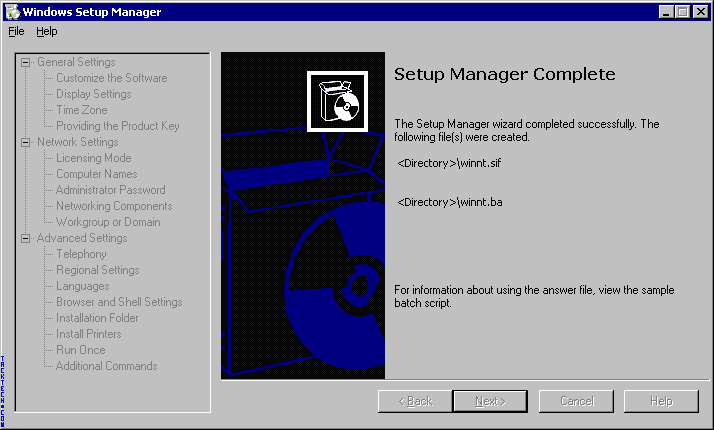 Jump to our Article on slipstreaming Windows 2000 or Article on slipstreaming Windows XP and skip to the section on burning the CD. 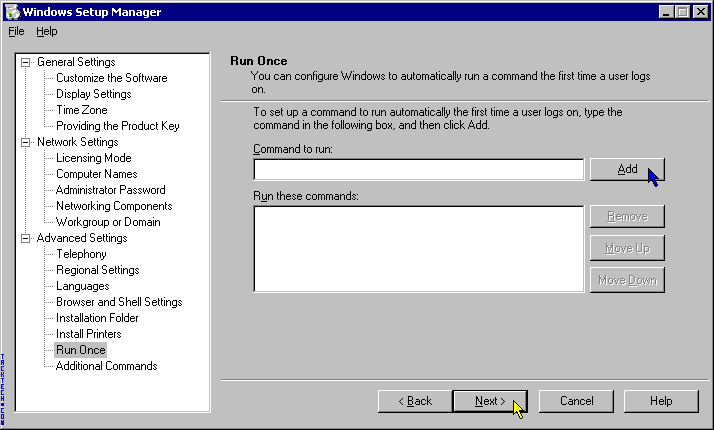 Follow the steps and you will have an unattended installation CD. Last Note: You edit winnt.sif with Notepad and add options not in the wizard. 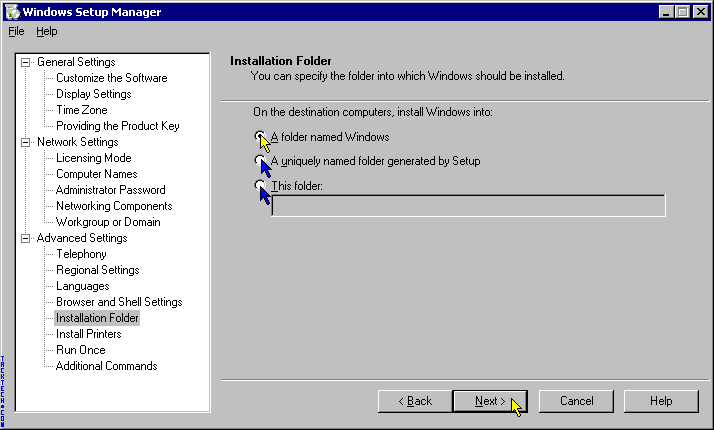 AutoPartition=0 it will prompt you for the size of the partitions. Repartition=No will prompt you for which Filesystem to use. You cannot automatically use FAT32 just NTFS. UnattendSwitch="yes" Will avoid the "lets spend a few moments setting up your computer"
WaitForReboot="No" This will not prompt the 15 second before rebooting. 10.25.2002 - Adjusted "Repartition=No" and "FileSystem=FAT32"